Rick Silva’s field guide posters are available for takeaway as part of the exhibition at Moving Image New York. Download Layar from the app store to view Claudia Hart’s Augmented Reality Moving Images on view at the fair. Silva modeled the first of his birds in 2014, inspired by a copy of ‘Sibley’s Field Guide to Birds’ and his readings on multiverse theory. 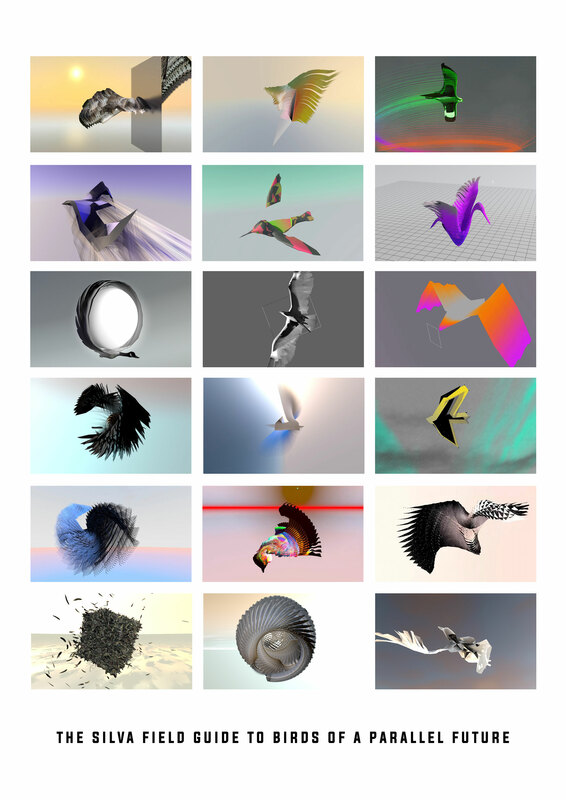 The ‘Silva Field Guide to Birds of a Parallel Future’ is a web-based video work consisting of 18 animations, 30 seconds each, accompanied by a short story by Claire L. Evans. Silva’s birds take flight over gleaming horizons with impossible geometries, flapping their wings with imaginary physics and stunning the viewer with beguiling colors and textures. 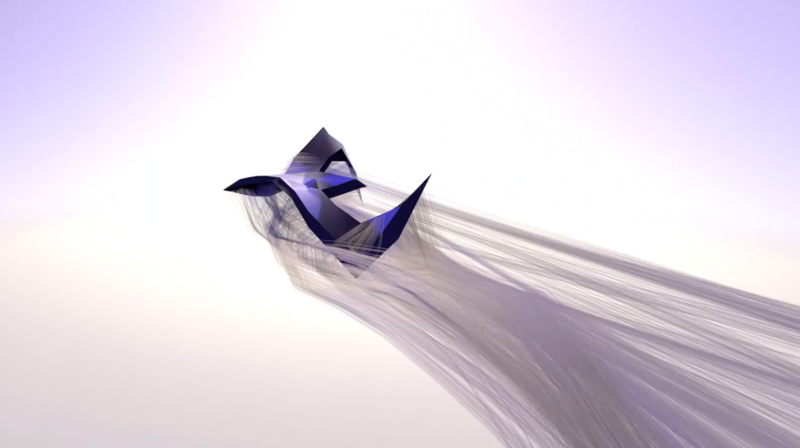 The work can be viewed online, displayed as a single-channel seamless loop, or in a grid featuring the individual birds playing on loop. Collectors receive an HD ‘Video Package’ delivered on a custom-designed USB, accompanied by a certificate signed by the artist. Rick Silva(1977, São Paulo, Brazil) is an artist whose recent videos, websites and images explore notions of landscape and wilderness in the 21st century. He received an MFA from The University of Colorado in 2007, and has since shown extensively nationally and internationally, with recent solo exhibitions at TRANSFER Gallery in New York, Wil Aballe Art Projects in Vancouver, New Shelter Plan in Copenhagen, and Ditch Projects in Oregon. His projects are included in multiple permanent collections such as The Whitney Museum of American Art and the Borusan Contemporary Collection. WIRED called Silva’s videos “glitchy, curious things; some mesmerizing, some arresting.” He lives and works in Eugene Oregon where he is a professor of Art & Technology at the University of Oregon. Claudia Hart has created decorative patterns that are in fact also computer codes – augmented-reality “tags” functioning like QR – that permit users, via her custom-designed augmented reality app, to see her fantastical embedded animations. Using their smart devices, viewers can look through her Looking Glass app to glimpse a world of pulsing invisible flowers harvested from the Flower Matrix, covered with animated graphics culled from Internet signage, computer code, and emoji graphics. Programmed by the artist, her multimedia craft objects are metaphors that unfold, using computer vision to reveal intoxicating layers of new information – the symbols for power, money and addiction found free-floating on the Internet. Claudia Hart has been active as an artist, curator and critic since 1988. Hart’s works deal with issues of representation, and the role of the computer in shifting contemporary values about identity and what might be called the natural. Her project is to de-masculinze the culture of corporate technology by inserting the irrational and the personal into the slick, overly-determined Cartesian world of digital design. She is widely exhibited and collected by galleries and museums including the Museum of Modern Art and the Metropolitan Museum, the New Museum, Eyebeam Center for Art + Technology, where she was an honorary fellow in 2013-14. She works with TRANSFER in New York. She is married to the Austrian media artist Kurt Hentschlager, and lives in Chicago where she is a tenured professor at the School of the Art Institute.